China, 2000 years ago: Loyang (LuÃ²yÃ¡ng) has risen to become the Capital of the Han Dynasty and one of the four great Capitals of old China. The economic upturn of the now-flourishing city requires a better supply of basic foodstuffs. You are local farmers, who plant wheat, pumpkins, turnips, cabbages, beans and leeks in their fields. 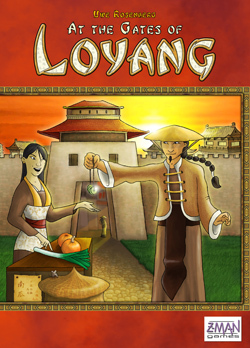 After each harvest, the farmers assemble at the gates of Loyang to sell and trade their vegetables. They deliver to their regular customers or lucratively sell their vegetables to passing shoppers. Vegetables can also be traded at Market stalls or used for seed and planted in fields. If the farmers need vegetables that they donâ€™t have in stock, they can buy them in the Shop. Twenty different helpers, each with different individual skills, are available to assist them. The most successful farmer will be the one who moves furthest along the Path of Prosperity within the given timeframe. Each step costs more and more money, which is also needed for investments. Farmers have to find the right balance. The coins have square holes, so that they can be held on strings. They have the Chinese name â€œCashâ€�, which is the derivative of the modern term. This third game in Rosenberg's harvest trilogoy (Agricola and Le Havre being the other two) can also be played solo. Contents: 4 T-shaped game boards (with Path of Prosperity and Shop), 12 Satisfaction markers (blue/red), 24 1-Cash coins (small), 14 5-Cash coins (large), 237 wooden vegetable tokens: 4 Scoring markers (to show progress on the Path of Prosperity), 2 Starting player tokens (1 larger, 1 smaller), 190 Cards, rules. Love all of Uwe's games, and this is no exception. Fantastic trading game. If you're into a tight economic game with tons of amazing components, look no further than the Gates of Loyang. For me, it's hard to differentiate yourself from your opponents by more than a point or so, but that is a positive if you prefer your games to be tense until the end! If you think this looks interesting, also check out Agricola! This is a great but often overlooked game in the Uwe Rosenberg series with Agricola, Le Havre, and now Ora & Labora. A little less player interaction in this one, which may be a bad thing for some but a great thing for others. Fun and brain burning!